The first HD system to hit the dirt was Fabtech's 6" system clearing 35" tall tires. 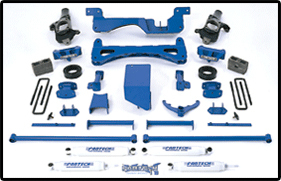 Lift is accomplished via one-piece cast drop down steering knuckles attaching to heavy-duty 1/4" thick, high arched lower control arm crossmembers with an integrated differential skid plate. Front and rear crossmembers are connected via tubular support tubes to provide additional front suspension rigidity. - May require drive shaft mods. ??? -?? ?Possible exhaust modification for some 2004-05 models.?????? - Will not fit vehicles with Quadrasteer. - If vehicle is equipped with factory 17" wheels must use 17" or larger aftermarket wheels.